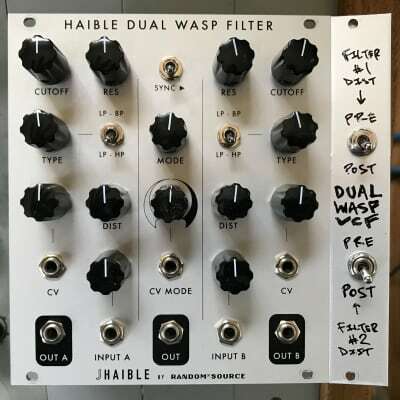 Jürgen Haible's WASP Filter is now available for eurorack in a dual version with some modifications and addons - including a MODE section that acts as a dynamic link between both filters. 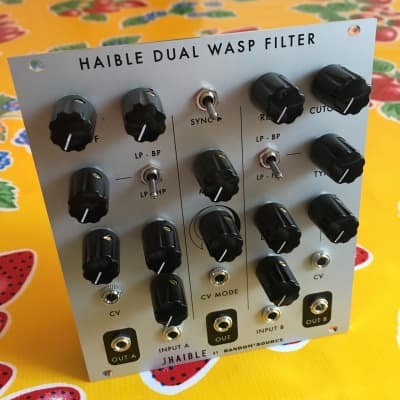 It allows to combine the filters in series or parallel or anything in between - even voltage controlled(!). Also, each side can blend from lowpass to highpass or bandpass (yes, the notch is in there, too!) creating infinite filterbank combinations. A Sync switch has been added to be able to control both side’s cutoff frequency with from the left side. The unique distortion can be configured to PRE or POST for each side. This is a (mostly) through-hole version containing very few optional SMT parts (not included). • MODE blends from serial to parallel setup - even CV controlled.